Chronic otitis media is generally associated with some degree of hearing loss, which is often the patient’s chief complaint. This hearing loss is usually conductive, resulting from tympanic membrane rupture and/or changes in the ossicular chain due to fixation or erosion caused by the chronic inflammatory process. When cholesteatoma or granulation tissue is present in the middle ear cleft, the degree of ossicular destruction is even greater. An issue that has recently gained attention is additional sensorineural hearing loss due to chronic otitis media. While the conductive loss can be minimized through surgery, sensorineural hearing loss constitutes a permanent after effect, attenuated only through the use of a hearing aid. However, a few groups have reported a decrease in sensorineural function in these patients as well. This survey study performed at a referral center evaluates the occurrence of sensorineural hearing loss in ambulatory patients with this disease. We reviewed the files of patients with unilateral chronic otitis media. One hundred and fifty patients met the inclusion criteria: normal otoscopy and normal hearing in the contralateral ear. 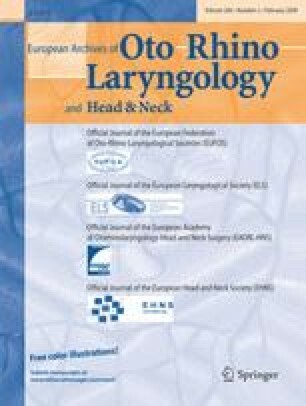 Main outcome measure: bone-conduction threshold averages were calculated for frequencies of 500, 1,000, 2,000, 3,000 and 4,000 Hz, with comparison between the normal ear and the ear with chronic otitis media. Thresholds were examined separately for each frequency. The bone-conduction threshold averages for the normal side were lower than those for the ear with chronic otitis media. The threshold shift was statistically significant for each frequency (P < 0.0001, Student’s t test). There were differences between the groups when analyzed for age (500 and 1,000 Hz) or the presence of cholesteatoma (1,000 Hz). This study shows that chronic otitis media is associated with a decrease in cochlear function.